Building has been a part of my psyche for as long as I can remember. By junior high, I was taking classes in architectural design, drafting and woodshop. Spending lots of tool time in my parents’ garage only furthered my passion. Many builders will tell you that they are passionate; that they deliver a quality product. 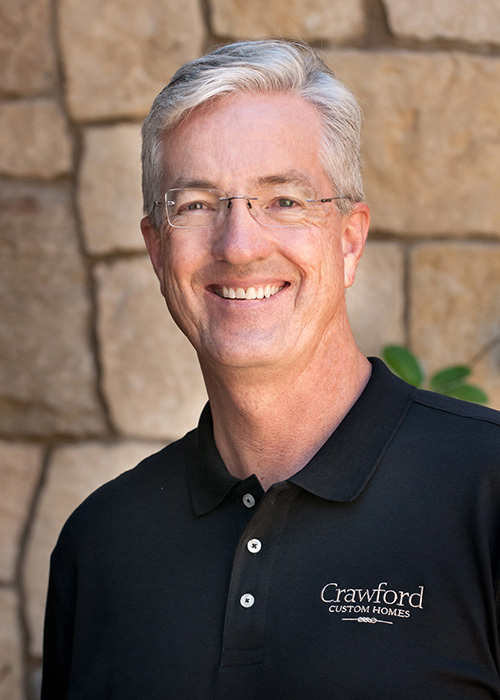 At Crawford Custom Homes, we are set apart from other builders as we live out our passion to create the extraordinary. Our hallmark is attention to detail combined with a sense of scale, creative craftsmanship, and elegance to result in a “Wow Factor” that is unparalleled. This is instilled in our team and experienced in each of our landmark homes. We invite you to tour our photo galleries and read testimonials from the most important audience—our clients. Day by day, step by step, we are honored to dream with them, plan with them and build with them. Together, we create homes that are true works of art, that meet every need and desire, and that our customers can spend a lifetime enjoying. Passion shines through in our results. We are devoted to honesty, integrity and fairness. Crawford Custom Homes is a professional building team dedicated to excellence in the construction of exquisite custom dream homes for our discerning clients. We are devoted to honesty, integrity and fairness. Our commitment is to provide unparalleled customer service with expert management, flawless quality and diligent project scheduling for timely completion. We create a dynamic atmosphere by vesting into a partnership with the owner, design professionals and the best artisans and material suppliers in the industry to provide unique, sophisticated and luxurious custom residences.